Field Naturalists Club clubrooms. Naturalists from many parts of Victoria were in attendance. Registration began on the Friday evening. Four different excursions were offered, repeated on Saturday and Sunday morning and Saturday afternoon. 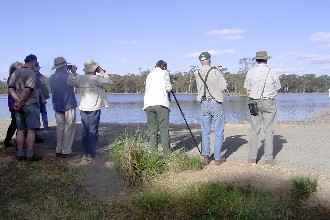 Havelock Forest and Maryborough Sewerage Works (for water bird observation). Some excursions also visited the Paddy Ranges Wildflower Reserve Number 2.
issues involved in management of these forests. SEANA members at the Sewerage Ponds.